I. A History of the Articles that were presented at Lambeth. II. 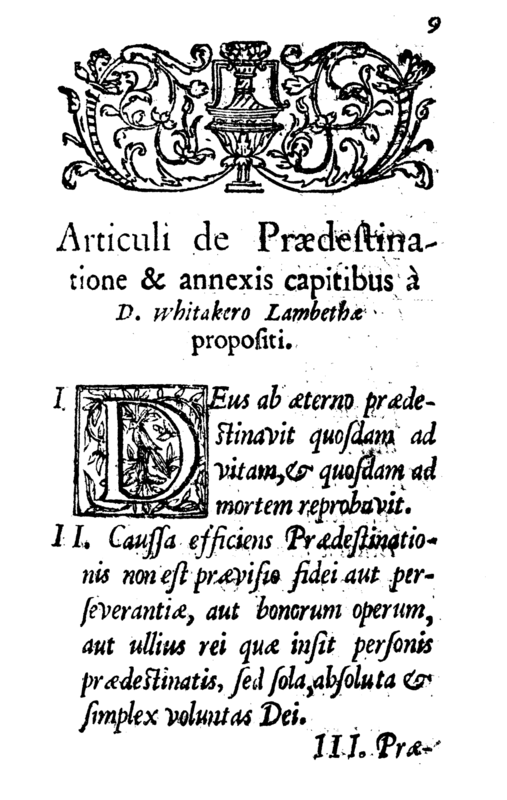 The Articles of Predestination, and the Adjoining Heads, proposed by Dr. Whitaker at Lambeth. III. The Same, as they were drawn up and approved of by Bishops and other Divines. IV. 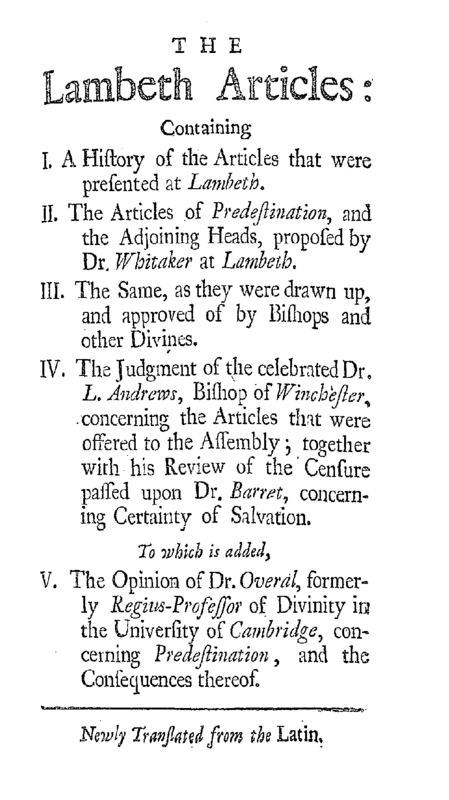 The Judgment of the celebrated Dr. L. Andrews, Bishop of Winchester, concerning the Articles that were offered to the Assembly ; together with his Review of the Censure passed upon Dr. Barret, concerning Certainty of Salvation. V. The Opinion of Dr. Overall, formerly Regius-Professor of Divinity in the University of Cambridge, concerning Predestination, and the Consequences thereof. Newly Translated from the Latin. 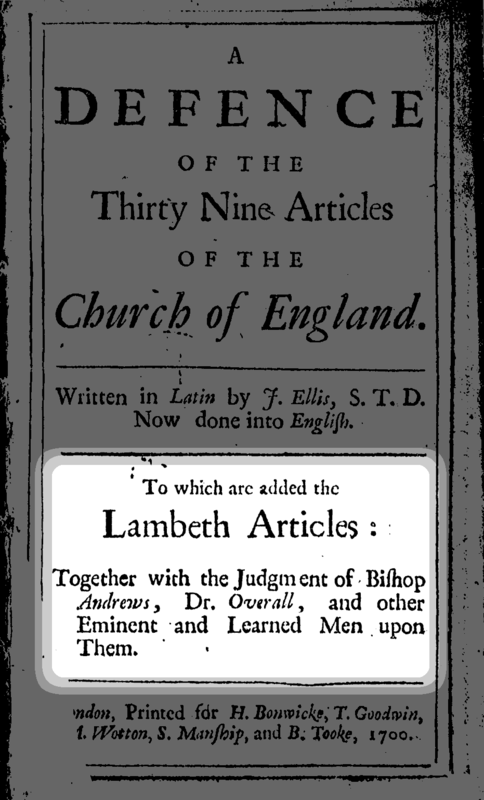 The History of the Lambeth Articles. IN the University of Cambridge there are two famous Professorships in Divinity; the one call’d Regius, having Henry the Eighth for its Founder; the other was founded by Margaret, the Mother of Henry the Seventh, and is called after her Name. It happened that Whitaker and Peter Baro were Contemporaries; the one Regius, the other Margaret‘s Professor in Divinity. 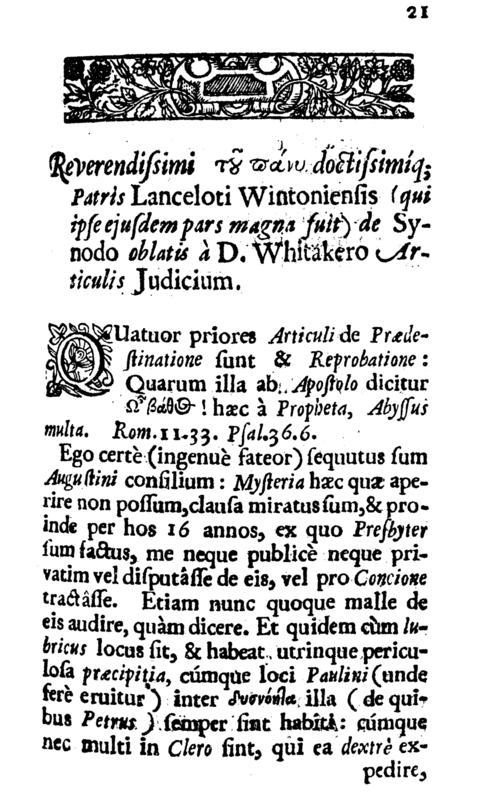 Whitaker was a Man of extraordinary Learning, and therefore his Judgment was of great weight, which way soever he took: He had studied long in reading the Fathers; and at length, whether for that he was related by Marriage to a * Family that was more than ordinary zealous for the Geneva Principles, or for whatever Cause it was, he became a Professed Defender of that Party. * His first Wife was Daughter to D. Culverwel, a Bourdeaux Merchant, but an Englishman and a Londoner. His second was Dr. Fenner‘s Widow ; That Fenner that did so violently oppose the Ecclesiastical Polity of England, and for that reason quitted the Ministry. 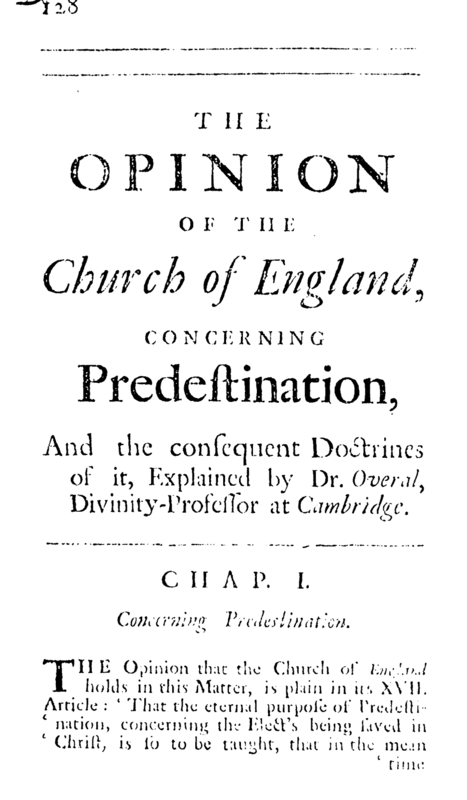 Amongst other Opinions, that are built chiefly upon the Authority of Calvin and Beza, he began to dwell much upon that of absolute Predestination; which indeed is such, as quite excludes the greater part of Men, by the Design of God and Christ, from sufficient Grace, and Christ’s Redemption: And as if this Opinion were not perfect, if it related only to the corrupted Mass or Body of Men, he was resolved to advance and carry it further, to an uncorrupted Mass: And upon this account blamed St. Austin because he said, that the Reason of Predestination was sought for and not found, but the Reason of Reprobation was sought for and found too. But Whitaker maintained, that the Reprobation which was passed upon the Mass not yet corrupted, was not purely negative, but did include an Affirmation; for, says he, this is the Decree and Will of God, whereby so many Men run into eternal Miseries. But Peter Baro having perhaps before considered this Matter, and was now, without doubt, moved by these Paradoxes of Whitaker, to search more diligently into all the Parts of this Argument, did at last, amongst the great variety of Opinions, conclude, that none was more probable, than that which Melancthon defended in Germany, Hemmingius in Denmark, and Snecanus in Friesland, viz. They placed a Foreknowledge of Faith, in order before Predestination; as the ancient Fathers, before St. Austin, did understand and teach; as also did St. Austin himself, before he contended with Pelagius; and for this they bring the Testimony of the Fathers themselves, and Beza confessing the same thing. After the Controversy of Predestination, followed two others (if yet we may call those two, where one is the necessary Consequence of the other;) 1. Concerning a Falling-off from Grace. 2. Of the Certainty and Security of Salvation. Baro maintained, that Faith and justifying Grace may sometimes be lost; This Whitaker denied: The one allowed a Certainty of Hope, the other a Certainty of Faith, and that an absolute, and not a conditional Certainty. This Opinion Baro particularly maintained in his Lectures upon the Prophet Jonas. When the Dispute of the two Professors had for a long time, as is usual, divided the Young Men into Parties, Whitaker at length takes a Journey to London, and goes strait to the Archbishop of Canterbury, giving him notice, that the University was corrupted with the Pelagian Doctrine; and unless some stop was put to it in time, this would come to an open Quarrel: Neither could he see any better Remedy at present, than that the nine Positions which he had drawn up, after the Perusal and Approbation of some eminent and learned Men, should be sent immediately to Cambridge. Now the Positions were wrote in such a manner, that one may easily discern the Skilfulness of the Man, in that nice and exquisite Turn of the Words, which for Peace sake would not be disapproved of, even by such as did not a little dissent from him. A Meeting of Prelates and Divines was then appointed (not a great Number) in November 1595. And because in such a perplex’d Argument as this was, the same Words and Things did not please every body, there were Disputations for some time. On the last Day it happened, that one or two who disagreed most from Whitaker‘s Opinion, were absent, and so the others prevailed. Now Archbishop Whitgift, that was the Head of that Meeting, altho’ he did not at all approve of Whitaker‘s Articles; yet thro’ Easiness, and a Fear of Disagreement, since he could not make good his own Opinion, himself became the Surety and Patron of another’s. However, the Assertions of Whitaker were not approved of in the same Words wherein he had proposed them, but some of the Words and Phrases were so altered, that one may easily discern, their Judgment did not altogether agree with his. * Burleigh, Chancellor of the University.These Positions were sent to Cambridge ; and Whitaker, in the mean time, boasting of the Victory that he had so easily gained without an Adversary, meets with a * Man that had the chief Authority in the Kingdom, one of the Queen’s Privy-Council, to whom also belonged a peculiar Care and Regard for the University; and to him he declares all that had been done in the last Meeting, and shews him the very Articles, as they were approved of by the Bishops: But that Great Man, (such was his Wisdom) easily understanding that Determinations in such controverted Points were dangerous, extremely disapproved of the whole Matter, and said, that he would make the Authors thereof repent of what they had done: And he was as good as his Word; for he went to the Queen, and took occasion to lay before her in a grave Oration, How that in such things as did appertain to the State of Religion, no body could, by the Laws of England, determine any thing, but by the Authority of the Queen, and that too with the Consent of Parliament. And this was a wise Institution; for there is generally a furious Zeal of Religion in Mens Minds, which, when it is once raised, makes them easily run into Parties and Factions. But now here are a few Divines, that have dared to make Decrees and Determinations concerning the most important Questions, which Learned Men for many Ages since could never yet agree about. But it is easy to see what these Men aimed at, whilst they think and teach, That whatsoever is done in human Affairs, be it good or bad, ’tis all bound up by the Law of an unalterable Decree; and that even the Wills of Men have this Necessity imposed upon them, that they are not able to will and desire any otherwise than as they do always will and desire. Which, (says he) if it be true, most Gracious Sovereign, to what purpose is it, that I and the rest of Your Majesty’s faithful Ministers do busy our selves about any thing, or take any Measures that may be of use to you, and the Kingdom’s Good; whereas all Consultations about such things as necessarily come to pass, were absolutely foolish and ridiculous? The Queen, being very much moved at this, commands the Archbishop to be sent for, and (with a smiling Countenance, mix’d with Majesty) told him, I hear, says she, you are reaping up great Wealth, and I suppose you have a mind to make me rich. The Archbishop, not knowing what the Queen meant by such an unexpected Speech, answered, My Riches are not over-great, but such as they are, Madam, they are yours. But, says the Queen, you now think you make me a Complement; whereas what you now offer me is mine already by the Laws of the Land, for you are fallen into a * Praemunire; and then she began to debate about the Assertions at Lambeth. The Archbishop at length discerning what the Queen meant; It was, says he, neither mine nor the Assembly’s Intention to determine any thing without publick Authority, or of our selves to make Canons; but it was only to interpose, for Peace sake, between the two Professors, that no private Quarrels might break out into publick Mischief. There were then present some of the Queen’s Counsellors, that did lay this Matter very hard upon Archbishop Whitgift, and told him, that the very Assembly was illegal, inasmuch as it was called without the Queen’s Knowledge; and that they might have consulted the Peace of the Church much better, if they had kept their Opinions to themselves. But to what purpose were the Assertions of the Bishops sent to Cambridge, but that they might have some resemblance of a Canon? And had it been such a troublesome thing once to have gone and acquainted the Queen with a Business that was disputed of for so many Days? And then they fell upon the Question concerning Fate, and vehemently debated it as a Position that neither countenanced Virtue nor the Commonwealth. 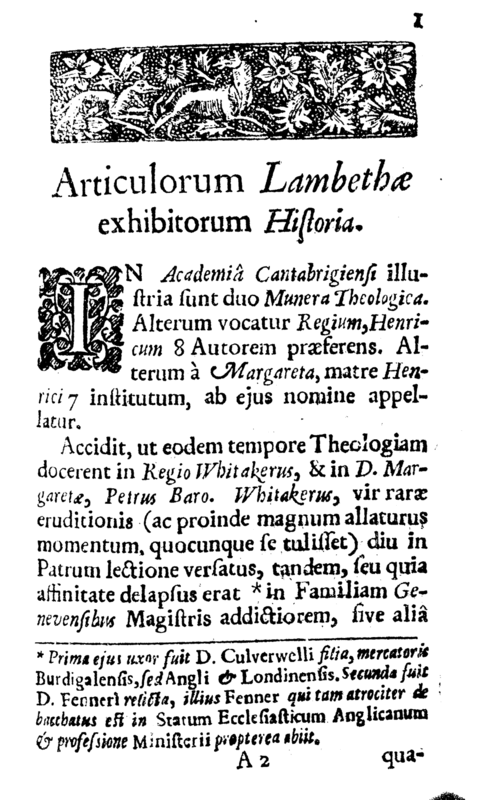 The thing at last ended thus; That the Archbishop should beg Pardon for what had been done so unadvisedly, and should promise to write to Cambridge to hinder these Lambeth Articles from being any further published or spread abroad; which also he did: But a long while after, as it seems, there was a Copy found amongst Whitaker‘s Papers, whereby at length this Work was made publick against the Consent of the Authors. * A Praemunire is an ancient Law of England, established, as ’tis thought, by Richard II. which forbids Ecclesiastics to assume to themselves more Authority, than is due to them by the Laws of this Land ; with this Punishment, that whosoever offends shall be sent to Prison during the King’s Pleasure, and his Goods confiscated. 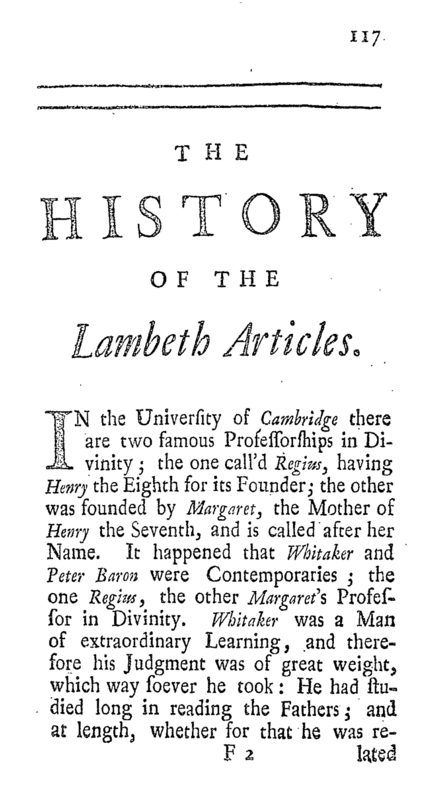 After these Articles were made, Baro continued both in his Professorship, and in his Opinion; but Whitaker died a few days after the Assembly at Lambeth. At length, Baro (his three Years being out; for, by the way, according to the ancient Institution, the Professors were to continue in that Lecture but three Years) quitted his Office, and retired to his private Studies. After these two, between whom the Contention arose, Dr. John Overall a most learned Man, was made Regius-Professor: He followed that way of speaking, which determines, That sufficient Grace is offered to every Man, and that Christ died for all: In every good thing Grace does operate first, and then in the next place, Free-will informed and actuated by Grace; But that Grace does operate in an unexpressible manner, and that not by binding up Men after a natural way, to particular Actions neither: That justifying Grace is not consistent with deadly Sins before actual Repentance. As to that obscure Controversy about Predestination, he behaved himself so, as to condemn neither the former nor the latter Opinion of St. Austin; as thinking there was no great matter of difference between them; especially since St. Austin himself has said, (after the Dispute arose betwixt him and Pelagius) that he had the same Thoughts then, as he formerly had when he opposed the Manichaeans; and that now he had not so much changed his Opinion, as his way of speaking. What happened afterwards, under the Reign of King James the First, An. 1603, may be seen in Dr. Barlow‘s Book published about that matter. For there Dr. Reynolds, with the rest that opposed the Bishops, amongst other things, which they thought did mightily tend to the Purity of the Church of England, they requested this also, that the Lambeth Articles might be put into the Confession: But King James would not grant their Request, thinking that such sort of Definitions did not tend to the Peace of the Church. Articles proposed at Lambeth by Dr. Whitaker. 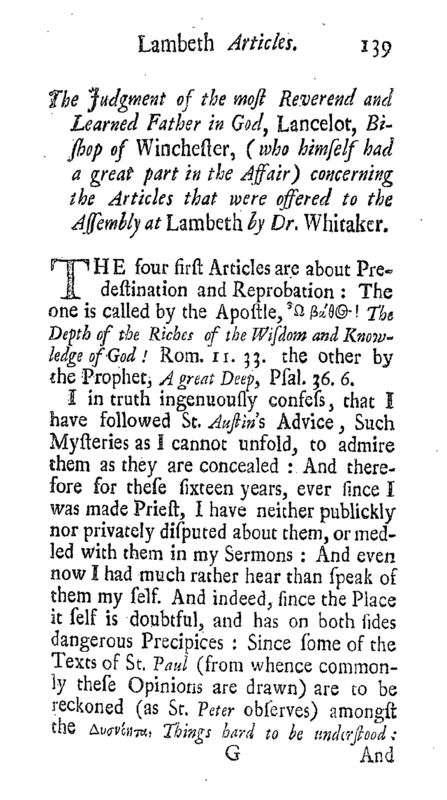 The Articles of Predestination, and the Heads adjoyning proposed at Lambeth, by Dr. Whitaker. I. God has from all Eternity predestinated some to Life, and reprobated some to Death. II. The efficient Cause of Predestination, is not a Foresight of Faith or Perseverance, or good Works, or of any other thing that is in the Person predestinated; but it is the sole, absolute, and simple Will of God. III. Of those that are Predestinated, there is a determinate and certain Number, which can neither be increased nor diminished. IV. Those who are not predestinated to Salvation, shall of necessity be condemned for their Sins. V. A true, lively, and justifying Faith, and the sanctifying Spirit of God, is neither extinguished nor lost, nor does it depart from those that have been once Partakers of it, either totally or finally. VI. A truly faithful Man, that is, one that is indued with justifying Faith, is certain with a Certainty of Faith, of the Forgiveness of his Sins, and of his eternal Salvation by Christ. VII. Grace sufficient to Salvation is not afforded, communicated, or granted to all Men, whereby they may be saved if they will. VIII. No Man can come to Christ, unless it be given him, and unless the Father draw him; and all Men are not so drawn by the Father, that they may come to the Son. IX. It is not put in the Will or Power of every Man to be saved. All these Propositions are either plainly inserted in the Book of Articles, and were always approved of in our Church; or else they may by a necessary Consequence be drawn and collected from the Articles. 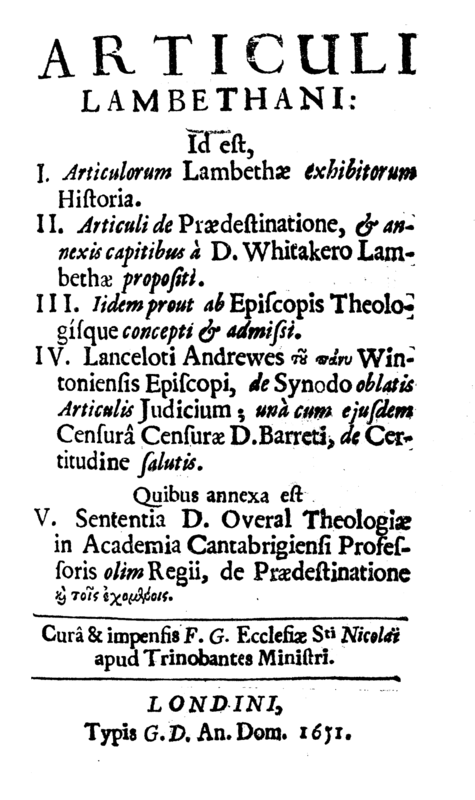 The Articles proposed at Lambeth, as they were drawn up by the Reverend Dr. Whitaker, in his own Hand-Writing, and presented to the Bishops and other Divines at Lambeth. 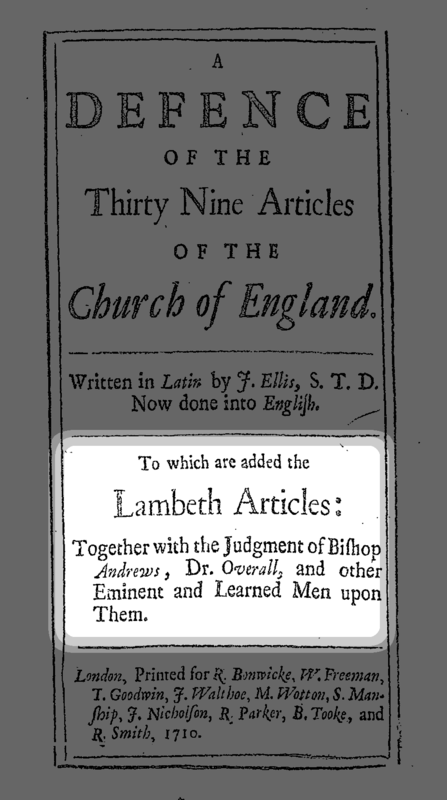 The Articles proposed at Lambeth, as they were drawn up by the Bishops and other Divines, and of the sense wherein they were admitted and approved of. God has from all Eternity predestinated some to Life, and reprobated some to Death. THis Article was admitted in the same Words; for if by the first [some] be meant Believers, and by the second [some] Unbelievers, here is no occasion of Contention, but it is a very true Article. The efficient Cause of Predestination, is not a Foresight of Faith or Perseverance, or Good Works, or of any other thing that is in the Persons predestinated; but it is the sole, absolute, and simple Will of God. The moving or efficient Cause of Predestination to Life is not a foresight of Faith, or Perseverance, or Good Works, or of any other thing that is in the Persons predestinated; but it is the sole Will of God that is well pleased. In this second Article there was added by the Lambeth Divines. 1. [moving,] 2. [to Life,] 3. The sole, absolute, and simple Will of God, is changed into, The sole Will of God that is well pleased, and that not without good reason: For the moving Cause of Predestination to Life is not Faith, but the Merit of Christ; since God designed Salvation for those that are to be saved, not for their Faith, but for the sake of Christ. The word [moving] agrees properly to Merit, and Merit is in the Obedience of Christ, and not in our Faith. These words [to Life] are added; because although a foresight of Infidelity and Impenitency be the Cause of Predestination to Death, and so likewise of any thing else which is in the Persons predestinated to Death; yet there is no Cause of Predestination to Life, but the sole Good-Will and Pleasure of God, according to that of St. Austin. The Cause of Predestination is sought for and not found, but the Cause of Reprobation is sought for and found too. [The absolute and simple Will of God] signifies some thing more than the sole Will of God that is well-pleased: For the Will of God well-pleased is Conditional: God would have us to do well, if we would not be wanting to his Grace; and it has pleased God to save all Men, if they would believe. Of those that are predestinated, there is a determinate and certain number, which can neither be increased nor diminished. In this Article there is nothing changed; for it is most true, if it be understood by the Fore-knowledge of God which is never deceived; for neither more nor fewer can be saved, than those whom God did foreknow. Those who are not predestinated to Salvation, shall of necessity be condemned for their Sins. 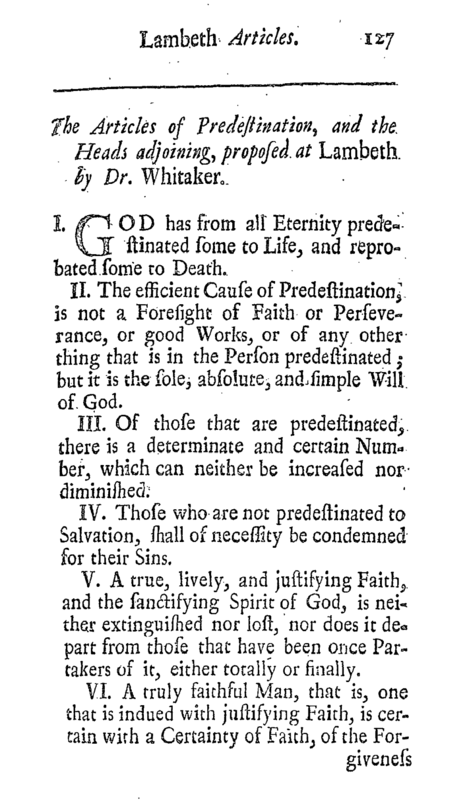 In this Article there is nothing changed, for it is most true, God having determined not to forgive Sins, but to such as believe: But if you would so interpret this and the former Article, as by a necessary Consequence to deduce from Predestination it self, both the Sin and the Damnation, and imagine that it proceeds from thence, you would plainly contradict St. Austin, St. Prosper, and Fulgentius; and with the Manichaeans, unavoidably make God to be the Author of Sin. A true, lively, and justifying Faith, and the sanctifying Spirit of God is neither extinguish’d nor lost, nor does it depart from those that have been once Partakers of it, either totally or finally. A true, lively, and justifying Faith, and the sanctifying Spirit of God, is neither extinguished nor lost, nor does it depart from the Elect, either totally or finally. In Whitaker‘s own Manuscript, the words are, [those that have been once Partakers of it] instead of which, the Lambeth Divines put [the Elect] quite in another Sense, and according to St. Austin‘s Sentiments; whereas in the Manuscript they are according to Calvin‘s Opinion. For St. Austin was of Opinion, That a true Faith, which worketh by Love, and thro’ which did proceed Adoption, Justification, and Sanctification, might fail and be lost too. Now Faith was a Gift that was common both to the Elect and Reprobate; but perseverance was peculiar only to the Elect. But Calvin‘s Opinion was, That a true and justifying Faith is to be found no where but in the Elect, and those that are to be saved. The eminent Dr. Overall likewise defended, both in the University, and at the Meeting at Hampton-Court, That a justified Person, if he fall into grievous Sins, before actual Repentance, is in a State of Damnation: And so likewise the contrary Opinion, which would bear us in hand, That a justified Person, tho’ he fall into grievous Sins, does yet remain justified, was condemned by the King’s Majesty. So in this Article, Whitaker‘s Opinion is wholly approved of. A true faithful Man, that is, one that is indued with justifying Faith, is certain with a Certainty of Faith, of the Forgiveness of his Sins, and of eternal Salvation by Christ. A true faithful Man, that is, one that is indued with justifying Faith, is certain with a Plerophory, or full Assurance of Faith, of the Forgiveness of his Sins, and of his eternal Salvation by Christ. There is nothing here changed; except that for [Certainty] the Greek Word [Plerophory] is put: Now some of the Divines would have had [Plerophory or full Assurance of Hope] put in the place of [Plerophory of Faith]; but the absence of some of them whilst the Business was transacting, caused the Word [Faith] to remain as Whitaker had wrote it. Now they make use of the Word [Plerophory] because it does not denote a full and absolute Certainty; such as is that of Science, or the Principles of Faith, (since Faith relates to such things as have Evidence and certain Knowledge on their side;) but only a less degree of Certainty, such as is admitted in Judicial and Court-Proofs. This Article is very true, if you understand it of the Certainty of the present State, nay, or of a future State, provided it be a conditional Certainty. For the Faithful believes that he has Faith, and he believes that a Believer shall be saved; He believes also that he shall persevere; but this not altogether with one and the same Certainty; because this Certainty depends partly upon the Promises of God, who does not suffer us to be tempted above our Strength; and partly upon the Sincerity of a a pious Resolution of obeying the Commandments of God in Holiness, for the time to come. De Civ. Dei, lib. 2. cap. 12.Otherwise, if the Article should bear this Sense, That a Man ought to believe, that he shall be saved, or is elected, with the same Certainty as he believes, that Christ died and is the Saviour of the World, this Assertion would plainly contradict the Confession of King Edward; in which may be read, That the Decree of Predestination is uncertain: And that of St. Austin, Predestination with us, whilst we are in the present Dangers of Life, is uncertain: And in another Place, The Just, altho’ they are certain of the Reward of their Perseverance, yet must own themselves uncertain of Perseverance it self. Grace sufficient to Salvation is not afforded, communicated, or granted to all Men, whereby they may be saved if they will. Saving Grace is not afforded, communicated, or granted to all Men, whereby they may be saved if they will. The Assembly have altered [Grace sufficient to Salvation] which was in Whitaker‘s own Manuscript, and put [Saving Grace] in the room; that it might plainly appear, that they spoke of that Grace which is finally saving, or actually efficacious, or such as of itself, without the addition of any new Grace, worketh Salvation. Now this is not afforded, nor so much as offered to all Men, since there are very many, such as Pagans, &c. to whom the Gospel has not been preached, either by an inward or an outward Call. Therefore those Words, [whereby they may be saved if they will] are to be understood of the next and immediate Power; for if they be understood of a remoter Power, the Words [sufficient Grace] were brought in to no purpose, and that is wont to be call’d sufficient, (not which is efficacious, and does of it self actually work Salvation, but) which is sufficient to lead a Man to Salvation, provided he himself does not put a Stop to it. And this was the Opinion both of St. Austin and Prosper, who say, That Grace was, at least more sparingly and more secretly, given to all, tho’ there be sufficient for a Remedy [ qui gratiam saltem parciorem, occultioremque omnibus datam aiunt, & talem quidem quae ad remedium sufficeret ]: Whence Fulgentius, That some are not assisted by the Grace of God, must be attributed to themselves and not to God [ Quod non adjuvantur quidam a gradia Dei, in ipsis caussa est, non a Deo ]. No Man can come to Christ, unless it be given him, and unless the Father draw him: And all Men are not so drawn by the Father, that they may come to the Son. In this Article there is nothing changed; for all Men are not drawn by the utmost degree of Force and Persuasion: But he that denies, that all Men are drawn by a remoter Force, takes away that general Assistance, or common Aid, which, as St. Prosper saith, rouses the Hearts and Affections of all Men. Now this Force or Drawing, the Lambeth Divines did not, with Whitaker, understand to be a physical irresistible Determination; but a divine Operation, such as is commonly wrought in the Conversion of Men, which does not take away the free Nature of the Will; but first makes it fit for a spiritual Good, in order to its being made good it self. It is not put in the Will or Power of every Man to be saved. In this also there is nothing changed; for it is most true, that our Salvation is primarily (not in our selves, but) from a preventing, moving, co-operating, and encouraging Grace in every good Work; and secondarily, from the Judgment and Will of Man consenting and agreeing thereto. There can be no Power of the Will towards a spiritual Good, unless Grace not only take away the Impediments, but furnish it with Strength too. It is not therefore placed in the Will chiefly and first of all; nay, in no sort is it placed in the Will, that any Man, whensoever he pleases, may attain Salvation: But that there is sometimes a sort of Power in the Will subordinate and agreeable to Grace, no body will deny, that has any Regard to St. Austin, Whilst we have Time, says he, whilst it is in our Power to do good Works [ Dum tempus test, dum in nostra potestate est opera bona facere ]; and in another place, speaking of the Punishment of Hell, There is a greater thing, says he, which you ought to fear, and which you have in your own Power to prevent coming upon you [ Majus est quod timere debes, & in potestate habes ne eveniat tibi ]. Judgment of Bp. Andrewes upon Articles. The Judgment of the most Reverend and Learned Father in God, Lancelot, Bishop of Winchester, (who himself had a great part in the Affair) concerning the Articles that were offered to the Assembly at Lambeth by Dr. Whitaker. The four first Articles are about Predestination and Reprobation: The one is called by the Apostle, Ὼ βάθος! The Depth of the Riches of the Wisdom and Knowledge of God! Rom. 11. 33. the other by the Prophet, A great Deep, Psal. 36. 6. I in truth ingenuously confess, that I have followed St. Austin‘s Advice, Such Mysteries as I cannot unfold, to admire them as they are concealed: And therefore for these sixteen years, ever since I was made Priest, I have neither publickly nor privately disputed about them, or medled with them in my Sermons: And even now I had much rather hear than speak of them my self. And indeed, since the Place it self is doubtful, and has on both sides dangerous Precipices: Since some of the Texts of St. Paul (from whence commonly these Opinions are drawn) are to be reckoned (as St. Peter observes) amongst the Δυσνόητα, Things hard to be understood: And since there are not many amongst the Clergy, who are able to manage such Matters with that Niceness and Dexterity as they ought, and few among the People that are fit and proper Hearers of such Things, I should advise (if it were possible) that nothing might be said on either side about it, that this Dispute might not every where be so rashly and unskilfully managed, as it is wont to be. It would be to much better purpose to teach our People plainly the Way to Salvation in things manifestly relating to a holy and a well-govern’d Life, than to trouble their Heads with the Secrets of Providence, and the hidden things of God: whereas an over-curious Inquiry into these Things does but turn Peoples Heads, and make them break out into Enthusiastick Frensies, and scarce ever tend to the Edification of strait and narrow Dispositions. However, being asked to give my Opinion concerning these Articles, (and that by your Lordship too; whom it is my Duty to obey) I answer thus in short. To the First, wherein Predestination is asserted. That God in his Eternal (whether you will call it Fore-knowledge,) or Knowledge, whereby he sees things which are not, as though they were, has predestinated some, and reprobated others, is (I think) without all manner of doubt. The Words of Scripture are [πρὸ καταβολῆς κόσμου] before the Foundation of the World; i. e. God has chosen us from all Eternity; and when he had chosen, did predestinate us, Eph. 1. 4, 5. Now it was out of the World that he hath chosen us, John 15. 19. And therefore he has not chosen All Men in the World, but only Some; otherwise it could not be called Election; But then those whom he hath not chosen, supposing him to approve of his Choice (as the Nature of Election bears) he hath reprobated: And for this the Scripture uses the Words [ἀπώθειν] to cast away, Rom. 11. 2. and [ἀποδοκιμάζειν] to reject, or reprobate, Heb. 12. 15. There seems to be almost the same Reason for Reprobation as for Election, for one as for the other: And if this do not appear plain enough, I would add, That some are predestinated one way, namely by Christ; and others are reprobated another, namely for their Sins. To the Second Article, wherein the Cause of Predestination is explained. Upon 11 of Rom. ver. 2. Edit. 2.And then in the second Place, it may be asked likewise, whether [this sole Will and Good Pleasure] includes or excludes the Fore-knowledge of God? I can by no means think that these Two things, [viz. to fore-know, and to predestinate] are to be separated, but we should rather, (as the Apostles do) joyn them together: But in this neither dare I give my Opinion rashly, or condemn the Fathers, who almost All do assert, that we are both elected and predestinated according to a Faith foreseen; which also Beza himself confesses, saying, That the Fathers are by no means in this Matter to be regarded who refer it all to a Foresight. In which notwithstanding, I should think, that they spoke rather concerning the Series and Order that God made use of in the Act of Predestination, than of the real Cause of it: Which Order some dispose one way, and some another, according to their different Apprehensions. But the Fathers seem to me to have thought thus; That there was no Election but what was disposed in this following manner. 1. That God loveth Christ, and then loves us in Christ; as also the Apostle says, Eph. 1. 6. That God hath accepted us in the Beloved. 2. Those that are thus accepted, he does endue with Grace and Faith. 3. Those that are so endued, and thereby distinguished from the rest he does elect: And 4. The Elect he does predestinate. Pag. 123.Most certainly the Nature of Election supposes, that there is some Difference betwixt him that is elected, and him that is rejected. So Oecumenius has it from the Opinion of the Greek Fathers, Speaking concerning Election, he has shown, that they differ from one another: for no body chooses one from another, except there be a difference between them. So likewise St. Austin [ad Simpl. 1. 2.] Election does not precede Justification (namely foreseen) but Justification precedes Election: For no body is elected, unless he be already at some distance from him that is rejected; whence is that Saying, That God hath chosen us before the Foundation of the World: But I do not see how that can be said but by a Fore-knowledge. Thom. Prima, Q. 23. Art. 4.2 Tim. 1. 9.And thus also the School-men. Predestination (saith Tho. Aqu.) pre-supposes Election, and Election Love: Namely, first God made them fit to be chosen, and then he chose them; he loved them that he might give, and he loved what he gave. And this likewise seems to be the Opinion of the most Reverend Archbishop of York, whose Words are these: What was it that God loved in Jacob from all Eternity, when he had as yet done no Good? without doubt it was something of his own, that he was about to give him. It is plain the Apostle does not fear to joyn together in this Business [his own Purpose] and [Grace given] and that from all Eternity; whereas that Grace given could not be but in Fore-knowledge; that is, with the Eternal Purpose of God, who foresaw that very Grace, which he would give before the beginning of the World. Nor do I think there is any Inconvenience follows from hence, That God should so choose to bestow his Gifts in us, as to crown us with what he gives; Namely, What by first loving us he gave, with the same, after it was so given, he did elect us: So that Love, which is an Act of Grace, whereby God makes a Difference, as well as Election, which is an Act of Judgment, whereby he chooses those that are so distinguished, are both preserved. And thus Election will remain. For that Order which the Moderns make use of, perfectly takes away all Election, whereby God is made to deal with Men, consider’d under no Circumstances, nor any way distinguished by his Gifts, but by a first and absolute Act, at one and the same time to predestinate some to Salvation, and others to everlasting Destruction: After such a Decree as this, I do not understand what room there can be for Election, or how that Decree it self can be called Election. But this whole Question (as I have said) is rather concerning the Order, in which God proceeds according to our Capacity, who know only in part, than of the Cause of it, as to the Act it self, which is one, and that most simple, in God. Or if it be about the Cause, it must not be understood, of the Cause of a first and absolute Act, but of the Cause in respect to its entire Effect (as they speak) in Predestination. It is ask’d again, Whether this be an integral Act (according to our Conception) consisting of various Actions, or whether it be that one single Act only? And if there be many and various ones, What is the Order and Series of them? Predestination (which must be joyned with Foreknowledge) supposes likewise Good Works (St. Austin of Predestination of the Saints, chap 10.) The Elect, before the Foundation of the World, are under that Predestination, whereby God fore-knows his own Facts that are to come, chap. 17. Again, Dare any one say, that God does not fore-know those to whom he will grant Faith to believe? (Of Perseverance 14.) Again, Therefore on whomsoever God bestows his Gifts, without doubt he fore-knew that he should bestow them, and in his Fore-knowledge prepared accordingly, chap. 17. and fol. 23. If there be no such Predestination as we defend, Men are not fore-known by God, but they are fore-known, &c. These [Gifts] therefore which the Church does, and always did, ask of God, those God fore-know that he should give to those that are called, as in Predestination it self he had already given them. To the Third, Concerning a certain Number. Chapter 3. de Cor. & Gra.They are St. Austin‘s very Words: The Number of those who are predestinated, is so certain, that none can be added to, or taken away from them. And so saith St Ambrose De Voc. lib. 2. cap. ult. The Fore-knowledge of God, which cannot be deceived, has lost nothing of the fulness of the Members of the Body of Christ ; neither by any Loss can the great Things fore-known and pre-elected from all Eternity in Christ, be diminished: For there is nothing so certain, as that the Knowledge of God is most sure, and cannot be deceived ; for the Lord knoweth those that are his. He that is not found written in the Book of Life, (i. e. predestinated) shall be cast into the Lake of Fire, says St. John, Rev. 20. Verse the last, i. e. shall be damned. And that he will be damned for his Sins, no body will deny; and that necessarily (if you will give me leave to say so) not by an absolute, but a conditional Necessity: That is, as the Article it self explains it, because of their Sins: It is because they have sinned, and not because they are not predestinated. Though at the same time I think we ought to avoid making use of the Terms [Necessity] and [Necessarily,] which the Fathers and Schoolmen have carefully done, and to substitute in their room [Certainly] or [without doubt] for we must avoid, as much as may be, all new Terms and Phrases. To the Fifth, Concerning the losing of Faith and the Spirit. I suppose no body ever said, That Faith may finally fail in those that are elected; for that to be sure it does not. But that it does not fail, is not, I think, from its own, but from the Nature of its Subject; from the Priviledge of the Person, and not of the Thing: And this by reason of Apostates, who ought not to be blamed for falling from that Faith, which was never true and lively. But now whether the Holy Ghost may not for a time be taken away, I think it is not yet decided, and I confess I am in some doubt my self. Concerning Faith, the Apostle says, Thou standest by Faith ; be not high-minded, but fear ; otherwise thou also shalt be cut off: Would not this be an ironical Precept, if he could not fall off? Therefore consider these following Texts. 1. Beware lest ye also being led away with the Error of the Wicked, fall from your own stedfastness, 2 Pet. 3.17. 2. Take heed that ye fail not of the Grace of God: For you that are under the Law, are fallen from Grace, Gal. 5.4. 3. Take not thy Holy Spirit from me, Psal. 51.13. 4. Quench not the Spirit. Would not all these be Ironical Precepts and Speeches, if we could in no sort fall off from the stedfastness of Faith, or from Grace, if the Holy Spirit could no way be quenched or taken from us? Though at the same time I am aware of this this too, that [Faith cannot be totally lost] may be so explained, as that wholly may relate to time, and the Sense will be this: Faith may be wholly lost now, and yet be recoverable hereafter. I am of Opinion, that with what Certainty any one is certain that he is truly faithful, or endued with Justifying Faith, with the same is he certain of his Salvation by Christ. Now I think this should be rather said to be a full Assurance of Hope (as the Apostle has,) Heb. 6. 11. than of Faith: And if you will have it in one Word, I would call it Perswasion rather than Faith: For we cannot have the same Certainty of those Propositions which are conditional, and require something on our Part to make them true; such as these, [He that believes calls upon God:] Or thus [If you believe you will call upon God;] as we have of those which are not conditional, but are purely positive and dogmatical, as that [God is Omnipotent.] Concerning the former, the Degree of Certainty is much less; and yet this sort of Faith does not hesitate in determining its Assent to one or other side of the Question. To the Seventh, Concerning Communication of Grace. De gen. Contra. Manich. lib. 3. I do not think that Saving-Grace is bestowed upon All; but to All it is offered, inasmuch as certain previous Dispositions towards it are not only offered, but even conferred upon All: And if Men were not wanting to these themselves, even Saving Grace it self would follow. The Words [Afforded, Communicated, Granted] if they be relative, and imply Reception, it is true that Grace is not so bestowed: But if they do not include any Relation, but that it is only offered on God’s part, or that God is ready at hand to grant and communicate it: In this Sense I think it is communicated to All. It is therefore offered, and God is ready at hand to bestow it: But it lies at Mens Doors that this Grace so offered is not conferred: For Grace is not wanting to us, but we are wanting to it. St. Austin‘s Words are: That Divine Light does not affect the Eyes of irrational Creatures, but the purified Hearts of such as believe in God, and from the Love of Temporal and Sensible Things, converts them to the Obedience of God, which all Men are capable of receiving, if they will; because that Light is common to All, &c.
It is truly said, that no Man comes to the Son unless he be drawn: And All are not drawn that they may come to the Son; i. e. So drawn that they shall come: but then we must add this too, That the Cause why All, either are not drawn, or so drawn as to come to God, is the corrupted Will of Men themselves, and not the Absolute Will of God. It is not placed either in the Free-will of any one, unless redeemed by the Son; nor is it in the Power of any one, unless it be given him from above to be saved. The Subject of this Dispute is of something to come; and every one as he stands affected, or has a Mind, wrests a Word to his own Opinion; and, if that be wanting, will supply it out of his own Sense. But I, as I have all along said, so even now would advise, that a faithful Silence might be enjoyn’d on both Sides. Let thus much suffice to have been said concerning Predestination and Reprobation; but let it be so understood, that I am willing, both in this Matter, and what relates to the Articles themselves, to submit my self and my Opinion to a Superiour Authority. Review of Censure upon Dr. Barrett. 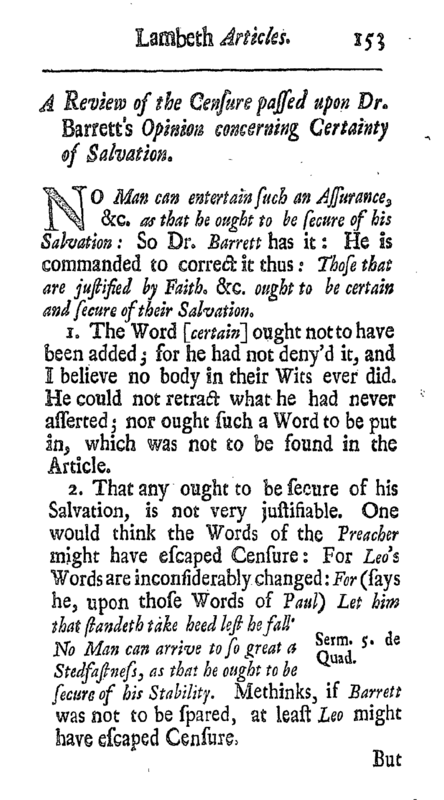 A Review of the Censure passed upon Dr. Barrett‘s Opinion concerning Certainty of Salvation. No Man can entertain such an Assurance, &c. as that he ought to be secure of his Salvation: So Dr. Barrett has it: He is commanded to correct it thus: Those that are justified by Faith. &c. ought to be certain and secure of their Salvation. 1. The Word [certain] ought not to have been added; for he had not deny’d it, and I believe no body in their Wits ever did. He could not retract what he had never asserted; nor ought such a Word to be put in, which was not to be found in the Article. Serm. 5. de Quad.2. That any ought to be secure of his Salvation, is not very justifiable. One would think the Words of the Preacher might have escaped Censure: for Leo‘s Words are inconsiderably changed: For (says he, upon those Words of Paul) Let him that standeth take heed lest he fall); No Man can arrive to so great a Stedfastness, as that he ought to be secure of his Stability. Methinks, if Barrett was not to be spared, at least Leo might have escaped Censure. Heb. 12. 15.Rom. 11. 10.August de Bono persever. Cap. 8. Bern. Ser. 1. de Septuag.But I have these following Reasons why I cannot approve of this Opinion, 1. The aforesaid place in the Censure is nothing to the Purpose, viz. Those that are justified ought to be secure: Whereas this is built upon Rom. 5. 1. Being justified by Faith, we have Peace with God. Without doubt! And therefore we may have peaceful, but not secure Thoughts; because Peace it self is not secure. For we are to take care in the first place, that this Peace be true; for as the Prophet says, They have healed the Hurt of the Daughter of my People slightly, saying, Peace, Peace, when there is no Peace, Jer. 6. 14. Ezek. 13. 10. And then if that be true, we are to take care in the second place, that the Conditions of this Peace be not violated and broken by us, and so it be taken away from us again. For thus saith the Lord, Jer. 16. 5. I have taken away my Peace from this People, even Loving-kindness and Mercy. And as we ought not to be secure, because we have Peace; so neither ought we to be so, because we stand in Grace, or by Faith; for such ought to consider what the Apostle saith: Take heed lest any of you fail of the Grace of God. And then he that stands by Faith ought to take heed of what the same Apostle saith: Thou standest in, or by Faith, be not high-minded, but fear: As also what he saith in another place: Let him that thinketh he standeth, take heed least he fall. Which Words of the Apostle are made use of by S. Austin and Bernard against Security. 2. The Holy Scriptures no where recommend Security, but rather seem to take offence at the Word: We ought to avoid it, since such are reproved by the Apostle, who would trust to it: For when Men shall say, Peace and Safety, then sudden Destruction cometh upon them, 1 Thes. 5. 3. Wherefore I think it ought to be avoided, as a thing of an ill Omen. Nor, 3. does the Reason and Meaning of the Word give any Countenance to this: For he that is secure, does not only banish all Doubtfulness, but even Care too: For Security is directly opposed to Care. But we are commanded by the Holy Ghost to make use of all our Care and Watchfulness: And the Apostle, Heb. 6. 11. desires That every one should shew the same Diligence, even unto the end. 4. But the thing it self, [viz. Security] seems to be repugnant to the Condition of a Christian Life, which is a Warfare; nay and to human Life too, which is a Tryal upon Earth; so that neither of these will admit of Security, but rather call for our utmost Care and Diligence, both to pray that we be not led into Temptation, and also to look to our selves that we be not tempted; And St. Paul gives this Advice even to those that are Spiritual, Gal. 6. 1. 2 Phil. 14.Rev. 3. 11.5. Those Words so often made use of by Christ and his Apostles [Watch, consider, take heed, try your selves, prove your selves] ought to shake off, and not to create Security: For what can these Words signifie, but a Command not to be secure. We have several other Expressions besides to this Purpose. Work out your own Salvation with Fear and trembling, saith St. Paul: Pass the time of your sojourning here in Fear, saith Peter, 1 Pet. 1. 17. And again, St. John; Hold that fast which thou hast, that no Man take thy Crown. All which Places give us to understand that Fear must accompany our Faith, least Certainty degenerate into Security. St. Peter, when he commands us to give all diligence to make our Election sure, means, without doubt, that we should on-strive for this Certainty; that every one should be so solicitous and careful about his own Concerns, as that he may at length arrive thereto: As much as to say, that an Endeavour after Certainty is all we are capable of in this Life; and a great Virtue in them who have it. But, 7. The degree of Certainty, which we have in this Life, must not stand in competition with what we shall have in a future State; some difference there must be allowed, and there can be nothing further or greater than Security: From whence it is, that [to enjoy a Security] is peculiar to those who are already dead, and can sing that Triumph of the Apostle, Death is swallowed up in Victory. But we that still sojourn here upon Earth, and are content with Moral Certainty, must forego that highest degree of Security, and leave that to the Church triumphant in Heaven, which alone is secure. 8. It has always proved fatal to such as have fancied themselves to be so certain as to run into Security. As David for instance. I shall never be moved, Psal. 30. 6. And Peter, when he said, Tho’ All shall be offended, yet will not I. It has succeeded much better with those who have been so certain, as yet to be careful; as with Job; I know, says he, that my Redeemer liveth, &c. Chap. 19. 25. And if I should comfort my self, yet I am afraid of all my Sorrows, Job 9. 28. And so St. Paul; I am perswaded, that neither Death, &c. Rom. 8. 38. and yet I keep under my body, saith he, least when I have preached to others, I my self should be a Cast-away, 1 Cor. 9. 27. 9. Altho’ what is alledged concerning Carnal and Spiritual Security be of no great weight, since by equal reason it may be spoken of Presumption or Pride; namely, improperly by a Figure; yet tho’ we may soften the matter thus, it is easie to be seen daily, what the Humour of our Age and People requires to be taught about this Thing; and whether it would be expedient, (as Mens Manners and the Times are) by such sort of Notions as these, to chill the already-frozen Zeal, and lazy Endeavours of Men to do any Good: And as if a certainty of Salvation was so small a Matter, to fill their Heads with a lazy Security: Since (as Gregory rightly observes) Security is the Mother of Carelesness; and since Despair proceeds not only from too great Fearfulness, (as in Cain;) but very often likewise (as in Saul) it takes its rise from too great a degree of Hope. 10. Lastly, I do not think that we ought to recede from the common and usual way of speaking in the Church, whose Thoughts are much the same with those of Leo afore-cited, That we neither can nor ought to be secure of Salvation. St. Austin says, Consil. 10. ch. 32. That no body ought to be secure in this Life, which is a state of Temptation, inasmuch as he that can rise from worse to better, may also fall from better to worse. Again (De bono Persev. ch 8.) God has wisely determined to mix some that shall not persevere amongst the certain number of the Saints, that those who have no pretensions to Security in this Life, may not be secure. So likewise, Chap. 22. Because no Body can be secure of eternal Life, which God, that cannot Lye, has promised before the World began, to the Sons of his Promise, until the consummation of this Life, which is a Temptation upon Earth; but makes us even to the end of Life to persevere in him, to whom we daily pray, that he would not lead us into Temptation. Again, Ep. 12. ad Prob. Whence it may seem wonderful, that you who, as to this World, are noble, rich, and the Mother of so great a Family, and consequently not desolate, tho’ a Widow, should yet have such an earnest and unwearied Zeal for Prayer: But that you prudently understand, that in this World, and this Life, no Soul can be secure. And a little after: For altho’ every one knows himself, and no Man knows another; yet no one is so well acquainted with himself, as that he can be secure of his future Behaviour. S. Chrysostom, upon those words of the Apostle ; If by any means I may apprehend: I have said, that I have believed Christ, and the power of his Resurrection; that I was made a Partaker of his Sufferings, and conformable to his Death, nevertheless, after all, I am not yet secure. And a little after, (Hom. 7. in Ep. ad Phil.) If therefore he that has suffered so great things, that has endured Persecutions and Mortification was not yet secure, what shall we say? St. Ambrose, upon Psal. 37. says, We are to understand it so, That altho’ any one be innocent, yet he cannot be secure, inasmuch as he has daily Combats with the most powerful Enemies. Thus also St. Hilary, upon Psal. 137. No good Man passes a Day without fear. Nor does that Faith, which is always anxiously careful of it self, venture to rely upon a lazy Security; for he knows that every Day has its Snares laid ready for him. Gregory likewise (in Epist. 186. ad Gregoriam) says, You have made an unprofitable Request, because you ought not to become secure concerning Sins, but at the last Day of your Life, when you shall not be able to lament and bewail them. Lastly, Bernard (Epist. 107. ad Thom. Beverl.) saith, After a Man is once come to a knowledge of himself in part, let him boast in Hope, but not yet in Security. Security and Fear are with Bernard two Extreams; the one is the Excess, and the other the Defect. See Serm. in Cantic. 11. That the Faithful are thro’ their whole Lives uncertain of their Predestination and Perseverance, St. Austin is very full and clear. De Corrept. & Gratia Cap . 13. almost at the Beginning. Contra Articulos sibi falso impositos , Artic. 12. In Epist . 107. 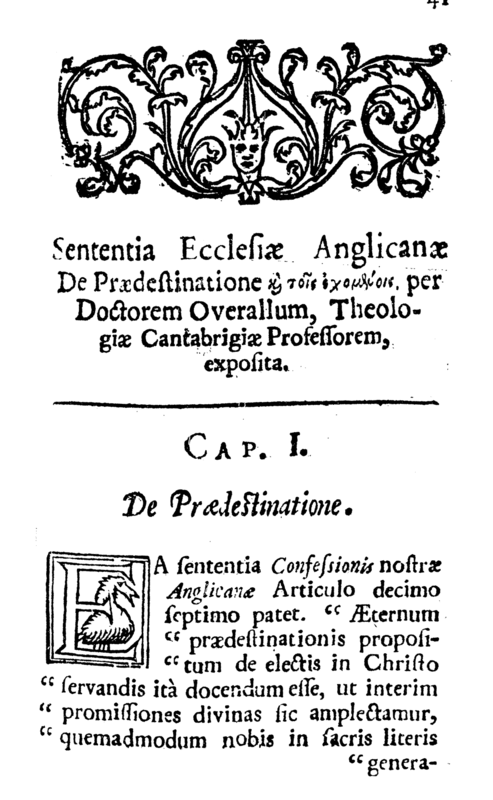 De bono Perseverantiae, Cap . 13. near the beginning; And then in his Book, De Civitate Dei . Book 11. Chap. 12. Opinion of the Church concerning Predestination. And the consequent Doctrines of it, Explained by Dr. Overall, Divinity-Professor at Cambridge. The Opinion that the Church of England holds in this Matter, is plain in its XVII. Article: That the eternal purpose of Predestination, concerning the Elect’s being saved in Christ, is so to be taught, that in the mean time we must receive God’s Promises in such wise, as they are generally set forth to us in the Holy Scriptures: And in our Doings that Will of God is to be followed, which we have expresly declared unto us in the Word of God. In all which we must suppose, that the necessary and effectual means both of inward Grace, and the outward Word towards the receiving the Promises of God, and doing his Will, are to be understood to be by vertue of his Gospel-Covenant, which is the ministration of the Spirit, and not of the naked Letter, according to that of Leo. He that looks only on the Duty goes without his Guide [ Qui instat praecepto, praecurrit auxilio ]. Wherefore under a general Promise and Precept, every one may safely repose himself by a stedfast Faith, and by a certain Hope and Trust, may come boldly to the Throne of Grace; at the same time assuring himself, that if he does not trust in God’s Promises, nor obey his Commands, he must blame himself, and not God; And own too, that ’tis thro’ his own Negligence, and not for want of Divine Grace; lest he fall into that of Solomon, Prov. 19. 3. The foolishness of Man perverteth his Way, and his Heart fretteth against the Lord; which St. Austin has frequently repeated against that Opinion. Our Article therefore has thought fit so to join that eternal purpose of God, concerning those whom he has chosen in Christ to be saved, with the Divine Precepts and Promises, as they are generally laid down, together with the Means and Assistances annex’d to them; that so we may fetch the original Ground of our Salvation, from the eternal stedfast Purpose of Divine Election, and not from any temporal unconstant variety of Man’s Will: That Grace may not be thought to be the necessary Consequence of Free-will, but that all our Vertue and Strength, in pious Affections and good Works, of Faith as well as Perseverance, is owing, not to the uncertain co-operation of Man’s Free-will, but to the efficacy of Divine Grace: That in the End all may be ascribed to God, and that he that glories, may glory in the Lord. These things being thus adjusted on both sides, this seems to be the Order of God’s Predestinating of us, set forth in the XVII. Article, viz. That God fore-knowing the Fall of Mankind, did, for a Remedy of the same, determine to send his Son, out of his meer Mercy and Compassion, and so in him placed the condition of our Salvation: For the performance of which he did appoint necessary Helps, and sufficient Means, more or less, to all in general. But to those whom he hath chosen in Christ, out of the rest of Mankind, he hath, out of his good Pleasure bestowed and granted a greater and more abundant provision of Grace; whereby they are most certainly led on to Faith, Perseverance, and eternal Salvation. As for the rest, they have nothing to complain of, for hereby is shown, both what the Free-will of Man left to it self, can do under the Aid of a common, yet sufficient Grace; and also the singular Benefit of a special and prevailing Grace in those, to whom God shall please to bestow it: So that St. Austin‘s Opinion is true, not only of the first Man, but likewise of all his Posterity. The God and Lord of all things has so disposed the Life of Men and Angels, as first to show therein what their Free-will could do; and then how far the Advantage of his Grace, and the Love of Justice would prevail. Thus God is the Saviour of all Men, but especially of them that believe, 1 Tim. 4. 10. which words of the Apostle, as Prosper thought, ought to determine this whole Cause. Chap. II. Concerning the Death of Christ. The Opinion of our Church concerning the Death of Christ is so plain, and every where so consistent with it self; That Christ died for all Men, or for all the Sins of all Men; that it is to be wondered, that any of us should ever have ventured to call it in question. It is said in the II. Article, That Christ truly suffered, was crucified, dead, and buried, to reconcile his Father to us, and to be a Sacrifice, not only for original Guilt, but also for all the actual Sins of Men. Article VII. As well in the Old as New Testament, everlasting Life is offered to Mankind by Christ, who is the only Mediator between God and Man, being both God and Man. Article XV. Christ came to be a Lamb without Spot, who by Sacrifice of himself once made, should take away the Sins of the World. And again, Article XXXI. The Offering of Christ once made, is that perfect Redemption, Propitiation, and Satisfaction for All the Sins of the whole World, both original and actual. Rom. 14. 9. 2 Cor. 5. 14, 15.And the same is to be met with in the common Catechism, as the most plain Sense of the second Part of the Creed, wherein it is proposed to every one to believe in God the Son, who hath redeemed him and all Mankind; according to the Nicene Creed, Who for us Men, and for our Salvation, descended, &c. And in many other places of our publick Liturgy; as in the Prayer of Consecration in the Sacrament: O God, who didst give thine only Son Jesus Christ to suffer Death upon the Cross for our Redemption, who made there, by his one Oblation of himself once offered, a full, perfect, and sufficient Sacrifice, Oblation, and Satisfaction for the Sins of the whole World. And to every single Person to whom the Sacrament is administred, ’tis said, The Body of our Lord Jesus Christ which was given for thee. And again,His Blood which was shed for thee, preserve thy Soul, &c. The Death of Christ therefore considered in it self must be a Price sufficient for All Men, if it was given for All. But the Scripture saith plainly, That God gave his Son for the World, and lays a condition thereon, not the Death of Christ, but the Faith of Man; and from thence Salvation is to follow conditionally: That the Son was so given, that, whosoever believeth in him shall be saved: But whether Men believe or not, God gave his Son for them, and through him offered Salvation on the Condition of Faith. Now that Men should perform this Condition, God does both command in his Word, and by the Grace of his Holy Spirit does actually excite and co-operate: So that if they do not believe, the Fault may be in Men, and not in God: As on the contrary, if they do believe, that must be attributed to Divine Grace, and not to any Humane Virtue. Whence it is plain, that it was God’s Will and Design that Christ should die for All; though All, through their own Unbelief and Impenitency, do not from thence receive the Fruits of Salvation. But then there are some Effects of this that do redound to All; as the Common Vocation; The Warnings and Encouragements, not only of the External Word, but of Internal Grace too: And lastly, the General Resurrection of All. For because Christ by his Death and Resurrection did overcome Death, and rose again, therefore shall all Men likewise rise again from the Dead; as the Apostle saith, 1 Cor. 15. 22. As in Adam all die, so in Christ shall all be made alive. For the same Reason has Christ obtained to himself a Dominion over all Men, because he died for All; As St. Paul has abundantly shewn. Which Places, as they sufficiently prove that Christ died singly for All, so they signifie to us, that both the general Promises of Salvation to all Believers, with whatsoever is sufficient for common Grace, and also the Purpose of particular Election, and Grace effectually persevering; nay, and the Preparation and Fore-knowledge of these, are all founded in the same Christ, and in his Death, fore-seen from all Eternity. So that out of the Side of Christ’s dying upon the Cross, not only the Sacraments of the Church, but likewise all saving Goods and Graces must be understood to flow. And this Opinion is so manifest in the Scriptures, that Calvin (who was otherwise sufficiently rigid about Predestination) in explaining those very places, which others brought to take away the Universality of Christ’s Death (as in some ’tis said that he died for Many) has every where interpreted them of All. Thus upon Heb. 9. 20. he says, that [Many] is taken for [All.] So again upon Rom. 5. 18, 19. It is certain, says he, that all Men do not receive Advantage from the Death of Christ, but then this is owing to their own Infidelity that hinders them. Which Words do plainly enough favour the common Opinion. Therefore it must not be said, that this which is so clear in it self [that Christ died for All] ought to be explained from an extravagant and rigid Conception of Secret Predestination; but we are rather to interpret that Secret by a thing which is plain in it self; that so it may be truly consistent with what was rightly enough delivered in a common Saying of the Schools, That Christ died for All sufficiently; For the Elect and Believers effectually: Had they not corrupted their meaning by the following Hypothesis: The Death of Christ had been sufficient for All, if God and Christ had so intended. Chap. III. and IV. Concerning Free-Will, and the Co-operation of Grace. The Definition of our Church concerning Free-will and Grace is short, being set down in the Tenth Article in these Words: The Condition of Man after the Fall of Adam is such, that he cannot turn and prepare himself, &c. In which Words both Merit and Strength towards any Spiritual Good are denied to Man in a fallen or sinful State, i. e. He cannot turn and prepare himself for Faith and Calling upon God, &c. Where notwithstanding it is supposed in the first place, that Man in Natural and Civil Matters has a Free-will, and does exercise his own Natural Strength, and even Good Works in that kind; with which yet he cannot turn and prepare himself to Faith and a Spiritual Good. 2. The necessity of Grace for the doing Works of Piety is shewn; because without (the Grace of God, we are not at all able to do such Works: Where also we may learn by the way, that the Grace of God being supposed) we can, and are able to do something towards Works of Piety. 3. From thence we understand how this Grace is given, and whence it is to be had; i. e. By the Grace of God which is by Christ. 4. We may learn likewise how Grace operates, viz. by preventing us that we may will, and by co-operating with us when we do will. Now Grace prevents us that we may will, by enlightning the Mind, inspiring the Will, injecting pious Thoughts and good Desires, and by seasoning the Heart with Zeal, and the Affections of Faith: Therefore of our selves we do not do a good Work, either because we do not know what is Good, or the Good does not delight us. So St. Austin explains this Matter: Ignorance and Infirmity, says he, are Vices which hinder the Will from moving towards any good Work, or abstaining from an ill one. Lib. 1. ca. 1. De Vocatione Gentium.Now that we may come to know what we were ignorant of, and that that may be made sweet, which before did not delight, the Grace of God is necessary to help and assist the Wills of Men; and if they be not helped hereby, the Fault is in themselves, and not in God. And then Grace co-operates with us, not only by concurring, but also by directing and protecting, by strengthening and helping of us; for our Endeavours to Good are nothing, if they be not excited by preventing Grace; and they are vain, if they be not assisted by co-operating Grace; as Bernard saith, De Gratia & lib. Arb. Nevertheless in both these Acts of Grace, Free-will is not taken away, but perfected. For, as the same Bernard says, Ep. 46. ad Valentinum. If there be no Free-will, there is nothing to be saved; and if there be no Grace, there is no Salvation. And so St. Austin: If there be no Free-will, how shall God judge the World; and if there be no Grace how shall he save it? Add to this that of St. Prosper: If the Will be taken away, where is the very Original of true Vertues? If Grace be taken away, where is the very Cause of Good Works? In all which, there is not one Word of the Operation of irresistible Grace: For although Grace may very often work certainly and infallibly, where it operates according to the purpose of eternal Election, and though it be certain, that the Decree of attaining the End proposed stands good, supposing the Divine Preparation and Fore-knowledge: Yet herein it does not operate by any irresistible Force, the Liberty of the Will being preserved, even under the Aids of Grace: So likewise in many other things (preventing Grace being supposed) it has an event suitable to its Liberty. Finally; in our Articles, and in many places of the publick Liturgy, the necessity of Grace is so laid down, that the Will notwithstanding is left free under Grace. Without which, all Laws, Precepts, Consultations, Conditions, Exhortations, Admonitions, Promises, Threatnings, Praises, and Dispraises, Rewards and Punishments would be offered and propounded to no purpose, and all reason and regard for Care, Diligence, Industry, Counsel, and Labour would be taken away: So that neither nothing, nor too-much ought to be attributed to Free-Will. And then on the one side, Free-will, both before and under Grace, will not (with the Defenders of irresistible Grace) be denied, or made of no Effect; nor, on the other side, will the Efficacy of Saving-Grace be destroyed by the Strength and Liberty of the Will. But so long as the Prerogative is granted to Divine Grace, the Will of Man, as a Hand-maid (tho’ a free one) will joyn it self to Grace, whilst it freely obeys its Dictates. Thus whilst it is awakened by the Admonitions of preventing Grace, prepared in its Affections, fortified and assisted with Strength, a Man may co-operate both freely and willingly with God, that he may not receive the Grace of God in vain. Chap. V. Of the Perseverance of Believers. Our Church’s Opinion concerning Perseverance is set forth in the Sixteenth Article: That Men, after they have received the Holy Ghost, may depart from Grace given, and fall into Sin, and by the Grace of God they may rise again, and amend their Lives: And therefore they are to be condemned, which say, they can no more sin as long as they live here, or deny the Place of Forgiveness to such as truly repent. Where we may observe first, that Sin which is there spoken of, and by which Men fall from Grace given, is in the beginning of the Article, called a deadly Sin willingly committed: For the preceding Fifteenth Article treats of common and daily Sins, such as are common to all the Regenerate; and in which we offend All, though we have the Grace of God, and do not fall from it. Now this Sixteenth Article is about deadly Sin: By which, after Baptism and the Holy Ghost received, Men depart from Grace given, until they be restored by Repentance: Where also All those are condemned, who say that this Sin cannot be committed after the receiving the Holy Ghost; such as Jovinian: and those likewise who deny Forgiveness in the Church to such as truly repent, as Novatian. But here is nothing at all said concerning a total and final Falling off from Grace. But in the Homilies concerning the Danger of departing from God (which were set forth at the same time in our Churches in the Book of Homilies) it is sufficiently intimated; That after Grace received, Men may fall from it, and perish; and therefore they are there diligently warned and armed against this Defection: And again in the Administration of Baptism, it is affirmed for certain, That Original Sin is remitted to Infants baptized, and likewise that they are truly regenerate; amongst which a great many notwithstanding do afterwards fall off and perish. But then the next Article (Seventeenth) frees those that are elected and predestinated from this Danger; teaching us that God has constantly decreed to free and to save them, but withal tells us, That Predestination is the Purpose of Divine Counsel secret to us, until it be made plain by the Fruits which in a due and natural Order arise and spring from it; which does not presently happen in All that believe, and therefore we ought not easily to presume upon Election; whereas Predestination regards only the Godly, those only who are truly such; and (as St. Austin and Prosper teach) such who feel in themselves the Power of the Holy Ghost mortifying the Deeds of the Flesh. Those that are rooted and confirmed in Charity, may with true Consolation think of the Divine Election, and have a stedfast Faith of obtaining Salvation through Christ; according to that Definition in Gratian and Lumbard, gathered out of the Fathers; Charity begun, is such as may be lost, but not a rooted and a perfect Love; according to that of the Apostle, Perfect Love casteth out Fear. Therefore, as on one side, All Believers, and even such as are truly Regenerate, are not under a Certainty of Salvation: So neither on the other are All (whatsoever Advances they have made in Faith and Piety) to be left to an uncertain Salvation: But to those who are solidly rooted in Faith and Charity (as to those that are elected and predestinated) we may allow a sure Confidence of Perseverance, and a firm Hope of Salvation. Without doubt that Opinion, so much debated; of the certain Perseverance of All those, who did once believe and were regenerated, was never approved of by any of the Fathers of the Primitive Church; but was rejected by all Antiquity; and has been too much confuted by the constant Experience of all Times. It had its Birth but in this last Age, and was then brought into the Church from a Quarrel that Zuinglius and his Associates had with Luther. Primary: ed., in Defence of Thirty Nine Articles, 1710 (London). Secondary: ed., in Defence of Thirty Nine Articles, 1700 (London). This work is a translation of the original 1651 Latin ed. 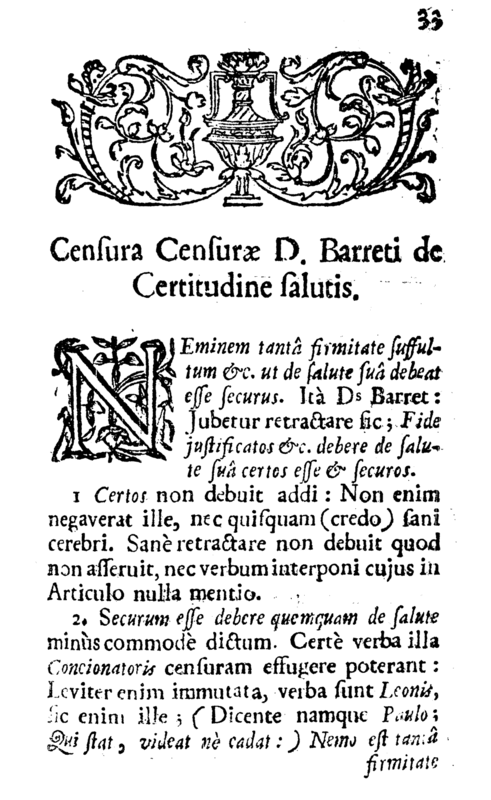 Some passages supplied from the original Latin of the 1651 ed. "Peter Baro" and "John Overall" spelled according to modern usage. I. History of Lambeth Articles. -debate of Whitaker & Peter Baro. -Whitaker inclines some to his side. -Baro prevails, Dr. Overall succeeds. -King James I forbids Articles. II. Articles proposed at Lambeth. III. Bp. Andrewes upon these Articles. -Predestination explained. IV. Review upon Censure of Barrett. -Security of salvation vs. Scripture. -Security of salvation vs. Fathers. V. Opinion of Church of England on Predestination.